The DFM Small Grants program supports initial research by faculty and fellows with the goal to publish in peer-reviewed journals and/or present at national meetings. 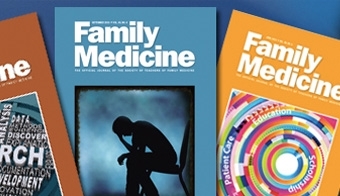 Projects funded by the Department of Family Medicine (DFM) Small Grants program in 2012 and 2013 resulted in over $1M in extramural grant funding, four presentations at national conferences, and three articles published in peer-reviewed journals. The DFM Small Grants program provides initial support for faculty and staff as they pursue scholarly interests consistent with the mission and goals of the DFM. After receiving a DFM small grant entitled “Transformative Learning through the Rural Hospital,” David Gaus, MD,went on to receive a $950,000 grant from Ronald McDonald House Charities for a project that uses new technology to train family physicians to manage chronic diseases in resource-poor settings. John Beasley, MD, leveraged a DFM small grant into a three-year, $105,000 award from the Agency for Healthcare Research & Quality. That award supports the annual conferences of the National Collaborative for Improving Primary Care Through Industrial and Systems Engineering (I-PrACTISE), an educational and research collaborative between the UW Department of Industrial and Systems Engineering, the DFM, and the UW Departments of Medicine and Pediatrics. The DFM Small Grants program also supported initial research by faculty and fellows that was published in peer-reviewed journals and/or presented at national meetings. DFM Assistant Professor Jennifer Edgoose, MD, MPH, was the lead author on a paper published in Family Medicine that surveyed the doctor-patient relationship from the perspective of patients considered to be “difficult.” (Edgoose J, Regner C, Zakletskaia L. Difficult patients: Exploring the patient perspective. Fam Med 2014; 46(5):335-339. Dr. Edgoose presented related work at the 2013 Annual Spring STFM Conference and the 2013 North American Primary Care Research Group Annual Meeting. DFM Associate Professor Randall Brown, MD, PhD, FASAM, was the lead author on “Qualitative Evaluation of the Experience of Participants in the Dane County OWI Treatment Court,” a presentation given at the 2013 American Society of Addiction Medicine Medical-Scientific Conference.